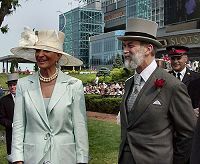 Price and Princess Michael of Kent in the royal box at Woodbine. 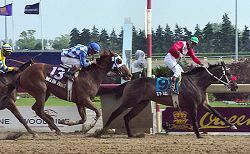 Canada's "Derby", the Queen's Plate, was run on Sunday afternoon at Woodbine under hot, hazy, humid, and windy conditions. Prince and Princess Michael of Kent were on hand as the Royal representatives, the first time since Queen Elizabeth II in 1997 royalty made the trip across the pond to deliver the 50 guinea prize originally awarded by Queen Victoria. Fourteen three year olds were slated to make the "gallop for the guineas" but only thirteen faced the starter due to the late scratch of Bravely who came down with an illness the morning of the race. There was no clear favorite so Sam-Son Farm's Ford Every Stream was sent off as the 2-1 choice with Classic Mike going off as the 3.35-1 second choice. By comparison, Ford Every Stream's stablemate Mountain Beacon was dismissed as the 85-1 longest shot on the board. Streakin Rob leading over Forever Grand, Cree Power, and T J's Lucky Moon. 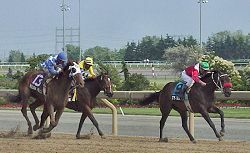 In deep stretch with T J's Lucky Moon out front while Anglian Prince and Forever Grand try to catch him. finished 3/4 of a length in front of Anglian Prince in a pedestrian time of 2:06.88 for the 1 1/4 mile feature over a fast track. The slow time was no doubt attributed in part to the 30 mile an hour headwind the field faced during both trips through the stretch. 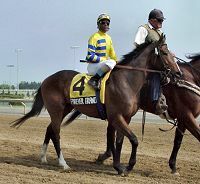 It was another length back to third place finisher Forever Grand, and a length and a half back to the favorite Ford Every Stream, troubled by a five wide trip. 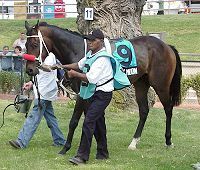 Paying a whopping $166.00 to win, T J's Lucky Moon is the second highest paying winner of the Plate in history, the record of $193.35 being set back in 1924 by Maternal Pride when the race was still held at the old Woodbine. It is a record payoff for the Plate run at the present Woodbine which opened in 1956, the old record being $48.10 set by Royal Chocolate in 1973. T J's Lucky Moon holds off Anglian Prince to take the Queen's Plate. 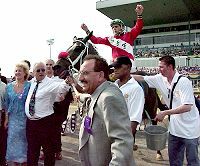 Steve Bahen and T J's Lucky Moon parade for the fans after winning the Queen's Plate. Bahen said: "The speed went out, and I just tucked in behind them after the wire (first time by). I didn't want to go wide. I stuck to the fence because Streakin Rob tends to get out a little bit. The rail is the shortest way around." 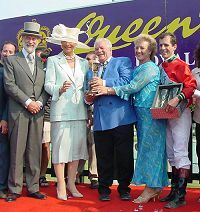 Prince and Princess Michael present the trophy to the winning connections. Owner Gino Molinaro said: "This has to be my most exciting race. 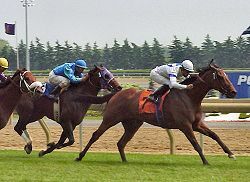 The other one I had was a few years ago (1996) when Kristy Krunch came in third in the Plate. But this is the most exciting one for sure. We looked at the mother two weeks ago and saw that she had 10 wins and 12 seconds; we really thought she was a pretty good horse. We took him (T J's Lucky Moon) more seriously three or four weeks ago than we had before. Vito did a great a job, the jockey did a great job - everyone involved did a great job." This was the first Plate win for the owner, trainer, and jockey. 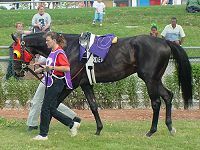 T J's Lucky Moon in the walking ring before the race. 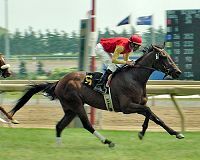 Trainer Vito Armata said: "The horse worked awesome at the training track and we took it from there. 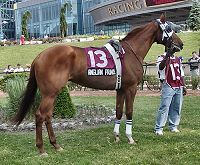 When (track announcer) Dan Loiselle asked me at the Queen's Plate breakfast where I wanted my horse to be at the half-mile point, I told him second. And (today) the horse was second. Steve (jockey Bahen) saved the horse enough on the inside and he got him home." 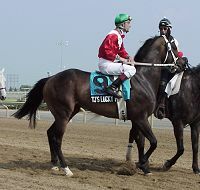 T J's Lucky Moon in the post parade. 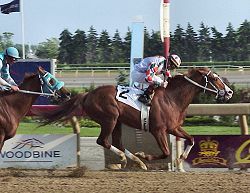 His trainer Vito Armata confirmed that the Plate winner will make his next start at the Prince of Wales Stakes at Fort Erie on July 21, the second leg of the Canadian Triple Crown. Second place finisher Anglian Prince in the walking ring. His jockey Jim McAleney said: "The race didn't unfold ideally the way we wanted it to. The pace wasn't as quick as I had hoped. I had to take him back further than I wanted to just to save a little ground going into the turn. The horse responded well to everything I asked him to do." Third place finisher Forever Grand in the post parade. His jockey Patrick Husbands said: "My horse ran a very good race. The owner, the trainer and even probably the rider - none of us could complain. He gave me 110 per cent. I had a good trip behind horses but that's not his running style." Favorite and eventual fourth place finisher Ford Every Stream in the walking ring. His jockey Todd Kabel said: "I had a good trip but I was wide the whole race and that didn't really help me. I don't think my horse ran to his potential but it's horse racing." 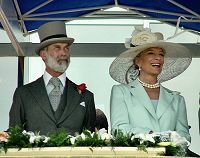 Prince and Princess Michael of Kent inspect the Queen's Plate horses in the walking ring. He is Queen Elizabeth's first cousin and she was a baroness in Germany before they married. 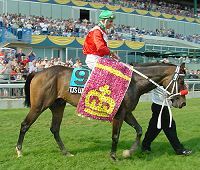 On the undercard was the Grade 2 $250,000 Nearctic Stakes, a 6 furlong turf sprint for older horses. California runner Nuclear Debate came from way off the pace to win by a length as the 2.35-1 favorite, defeating Joe's Son Joey by a length in a time of 1:07.86 over a very firm course. Winning jockey David Flores said, "He ran very impressively last time and I was expecting the same thing today. It got a little tight around the turn but then when we came to the stretch, I was just waiting for a place to go. Then it kind of spread at the top of the stretch." Also on the undercard was the $100,000 Charlie Barley Stakes over one mile on turf for three year olds. Sam-Son Farm entrant Portcullis came from dead last early on to win going away in a time of 1:33.92. Jockey Slade Callaghan said "I knew I had a lot of horse when we hit the stretch and nobody really came at him. He's a very strong horse and he was full of run today." Trainer Mark Frostad added, . "He's a very good competitor and he's been very consistent each time out." Changeintheweather, who had been on the American Triple Crown trail earlier in the year, finished a disappointing 6th. The last race of the day was the $100,000 Sweet Briar Two Stakes for older fillies and mares sprinting 7 furlongs over the main track. 2.70-1 second choice Devastating defeated the 6-5 favorite El Prado Essence by 3/4 length in a time of 1:22.75. Queen's Plate Barbecue Photos - Monday the horses are paraded for the crowd at a barbecue in the walking ring. Photos of 10 contenders and their connections with comments.